DORTMUND — Dortmund v Monaco saw die Schwarzgelben struggle in the first half. 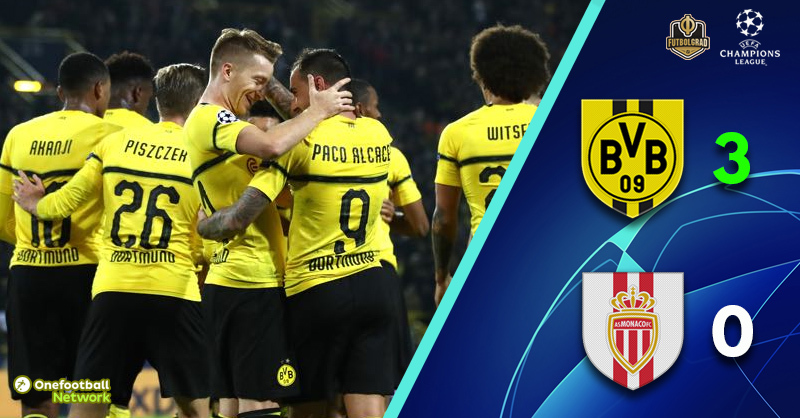 Dortmund then turned it on in the second 45 to walk away with an impressive victory. In what was a wide open and energetic start both sides looked to explore the wide areas in the opening phase. Dortmund head coach Lucien Favre opted with a double pivot of Axel Witsel and Thomas Delaney – it was a setup that provided die Schwarzgelben with stability but also lacked creativity in the opening stages of the first interval. Monaco, in the meantime, were kept out of the box but had the first chance nonetheless. Youri Tielemans was given to much room just outside the area and opted unleash a shot from about 25-yards out that forced BVB keeper Roman Bürki into a fantastic save in the 19′ minute. And Dortmund? Die Schwarzgelben struggled to create anything tangible in the opening 30 minutes. 32′ minutes were played when Paco Alcacer was left wide open at the edge of the box, and his curled effort missed the far post of Diego Benanglio’s goal by just a whisker. Then in the 39′ minute, Marius Wolf was left open in the box and once again the shot curled towards the far post and Benaglio had to stretch to tip the ball around the post. Unfortunately, Benaglio picked up a knock during that save and had to be replaced by Croatian national team keeper Danijel Subašić just before the halftime tea. Lucien Favre then opted to make a change at halftime bringing on Jacob Bruun Larsen for Wolf and once again the Swiss head coach had the right nose. 52′ minutes were played when Sancho played through a ball to Bruun Larsen, who then had no problem scoring with a precise low shot from about 12-yards outs. Dortmund were now up front but not in the clear. Monaco started pressing higher up the pitch threatening Dortmund’s backline. At the same time that approach gave die Schwarzgelben some room to counter, in the 60′ minute Alcacer was almost through after a great pass by Witsel and in the 62′ minute Marco Reus was left blank in the box but missed the net. Reus was also the protagonist in the next chance for Dortmund. The forward managed to break into the box in the 69′ minute where he was brought down by a Monaco defender. Referee Aleksei Kulbakov did not hesitate and pointed to the dot. Alcacer’s penalty, however, hit the underside of the bar and stayed out. In the 70′ minute, Dortmund were at it again. Jadon Sancho broke through and went one-v-one with Subašić, but his shot went over the bar. Not that it mattered, because just one minute later, in the 71′, Paco Alcacer managed to beat the offside trap slalomed past two Monaco defenders to score from six-yards out. The lead was deserved, but in the 77′ minute, Monaco almost got one back. A low pass from the left from Benjamin Henrichs found Samuel Grandsir free inside the six-yard box, but his backheel shot rolled past the far post of Bürki’s goal. It was a fair warning for Dortmund and Favre’s men now systematically shut down the opposition. Furthermore, Dortmund were able to add to the scoreline. From the left, Bruun Larsen played a low ball across the goalmouth right to captain Reus, who capped his man of the match performance with a goal. Marco Reus excellent form continues. The German national team forward was excellent throughout the 90 minutes. Reus completed 82.5% of his passes, played four key passes and succeeded in all three of dribble attempts. The 29-year-old also earned Dortmund’s penalty. But it was not just in the attacking end where Reus was impressive. The captain also made two important interceptions and one clearance. He then capped off his impressive performance with a fantastic goal in the last minute. Once again the attacking power came from the bench for Borussia Dortmund. Die Schwarzgelben struggled in the first 45 minutes, and it was only after Favre brought on Bruun Larsen for Wolf that Dortmund finally found a way to break down Monaco. Jacob Bruun Larsen has scored on his Champions League debut for Dortmund after 6 minutes. The only Dortmund player to score faster on his CL debut was Andreas Möller (1 minute, September 1995 against Juventus). Monaco are without a win in ten European games (D2 L8) since that 3-1 home victory against Dortmund in the quarter-final second leg in April 2017.